UC Santa Barbara physics professor Philip Lubin has been thinking about how to harness the momentum of photons, the particles that make up visible light, for years. And over the past few weeks, his work has captured the public’s imagination because of his suggestion that photonic propulsion could help us reach Mars in 72 hours. It’s not surprising that the idea of getting a robot to Mars in a few weeks, and getting humans to Mars in a month, would make waves. NASA has promised to bring people to Mars in the next 14-24 years, but officials remain skeptical that NASA will be able to pull that timeline off. One concern is that the journey to Mars, which currently clocks in at about eight months each way, might be too long. We’ve never sent humans into deep space, let alone for months at a time, and the potential health ramifications are frightening. But Lubin said that focusing on a speedy trip to Mars is missing the forest for the trees. For one thing, we’re still very far away from seeing the dream of photonic propulsion (essentially, propulsion via a very large, powerful laser) realized—bringing directed energy into NASA’s rocketry wheelhouse certainly won’t happen during the 2030s, when NASA wants to drop people on Mars. Though the revolution Lubin predicts is decades away, here’s how it might help us in the future—and already is today. We’re already using photons to power the technologies we rely on every day. Loucas Tsakakakos, manager of the Photonics Laboratory at GE Global Research in Niskayuna, New York, explained in a 2012 blog post that photons are crucial in making chips that are used in smartphones and TVs through photolithography, a light-printing process that allows engineers to build the tiny chips. Plus, photonics are important to communications. As Tsakakakos explains, "fiber optics have been used as the primary means of moving data at high rates and over large distances, sometimes directly on the sea floor." Without photonics, we would not be able to communicate at the speed or with the style we do every day. In addition to powering the communications products and lasers we use today, photons are expected to solve some of the problems that electronics can’t— like how to employ light (in the form of lasers) to avoid the the messy issue of overheating, which keeps computers from exceeding a certain speed. Photonics means we can expect much faster computers in the future. And when we get better cameras on our smartphones, you can thank photonics for those. On a grander scale, photons could help save us from an asteroid strike. Photonics is what make lasers work, and Lubin is not the only one who thinks we should use lasers to deflect or destroy asteroids. Lubin’s plan, the Directed Energy System for Targeting of Asteroids and explorRation (DE-STAR), is to use photonics to vaporize a harmful, Earth-bound rock. He and his co-researchers explained in a recent paper that “Evaporation at the laser spot produces a vaporization plume thrust that can be used to change the asteroid’s orbit and effectively deflect asteroids from colliding with Earth." Lubin said he’s confident that the technology can be used to “de-spin,” “deflect,” and “derotate” oncoming asteroids. Sounds pretty good, especially since NASA doesn’t really have a plan to shield us from an asteroid strike. NASA is still trying to work out how it would deflect asteroids—but is focusing more on exploding the rock or knocking it off course with physical force, rather than laser technology. So far, Lubin says, NASA has been receptive to his research but "I’m not expecting NASA to buy into building a large-scale system any time soon." Testing out the concept and bringing it to fruition would be expensive and—as NASA is not expecting to face an asteroid anytime soon—impractical. One of the most exciting things about potentially reaching deep space, quickly, is that it could help our search for extraterrestrial life. In the aforementioned NASA video, Lubin said that “within about 25 light-years of the Earth there’s actually quite a few potential exoplanets and habitable things to visit…. there are many, many targets to choose from, the closest is Alpha Centauri which is about four light-years away.” Traveling at the speed of light would mean a four-year long journey to the nearest star system—not a short trip, but much more feasible than the 165,000 years it would take a space shuttle to get to Alpha Centauri. 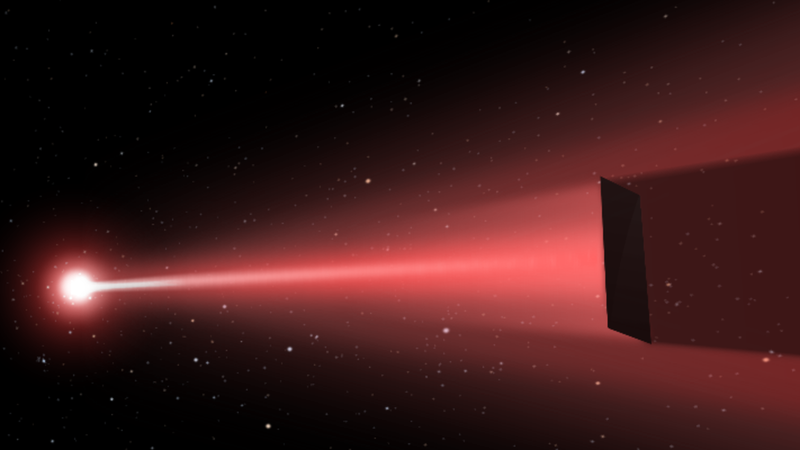 On the off chance that there is life on one of the habitable planets in Alpha Centauri, photonic propulsion means we might actually be able reach it. SETI is an exploratory science that seeks evidence of life in the universe by looking for some signature of its technology… Whether evolution will give rise to intelligent, technological civilizations is open to speculation. However, such a civilization could be detected across interstellar distances, and may actually offer our best opportunity for discovering extraterrestrial life in the near future. The technology, then, could bring people to Mars in a matter of weeks—once we have the technology to actually slow down and stop the spacecraft to land without crashing. But in terms of getting to Mars in three days, Lubin stated, “I would say don’t plan on it in your lifetime.” Duly noted.